The Old Timer's completed the construction of an authentic Pioneer Shack on the Calgary Exhibition and Stampede grounds. Over a period of twenty years improvements were continually made to the Shack and the grounds surrounding it. In 1937, the Women's Association caused to be erected a pioneer kitchen as an addition to the Shack and in 1939, a further building adjacent to the Shack was constructed to be used as a Tea Room. For years, SAPD continued to hold its meetings and events in the Pioneer Shack. In 1955, the Pioneer Shack was replaced with a modern log building (Rotary House), with the financial assistance of the Rotary Club of South Calgary. Rotary House was dedicated to the pioneers of Southern Alberta and the SAPD installed certain artifacts of the SAPD on loan to the Calgary Exhibition and Stampede. As a result, the SAPD has use of the Rotary House during Stampede week to entertain pioneers, their descendants and guests. 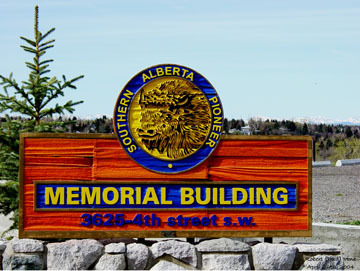 To commemorate the pioneers of Southern Alberta and as part of Alberta's Golden Jubilee, the SAPD had constructed The Southern Alberta Memorial Building at its present location in the Rideau Park area of Calgary. Situated on a high promontory overlooking the Elbow River it gives the building a general view of the city and commands a splendid view of the Rocky Mountains to the west. In the late 1800's bull trains and Red River carts from Fort Benton, Montana, and stagecoaches from Fort Macleod, with their dusty, travel-stained passengers and picturesque stage drivers passed by this site on their way to Calgary. The building is an excellent example of Rustic style architecture and comprises hand-hewn, round logs with saddle-notch joints, typical of the vernacular mountain architecture in the West. The interior features exposed, clear-span trusses, a massive fieldstone fireplace and handcrafted doors and finishes. 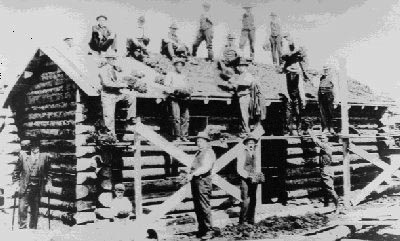 The Memorial Building was constructed by Hobart A. Dowler, a leading master craftsman and builder of log structures in Alberta. 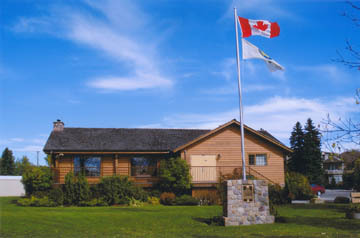 As with Dowler's other log buildings, the Memorial Building was first built on his Pigeon Lake property in Central Alberta and later dismantled and re-assembled on its permanent site in 1954. 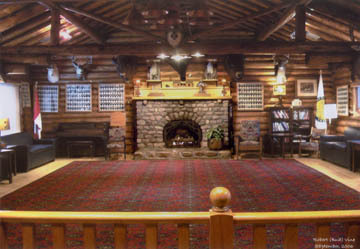 Between 1932 and 1958 Dowler and his son Bill were commissioned to build approximately 100 log buildings, notably the Stanley Mitchell Hut (1940) for the Alpine Club of Canada, a designated Federal Heritage building, the Rundle's Mission Memorial Lodge (1958), a designated Alberta Historic site, and the Northern Alberta Pioneers and Descendants Association Old Timers Cabin (1959), a City of Edmonton Historic Resource. The Memorial Building was dedicated on June 8, 1955 with the City of Calgary erecting a field stone cairn with an attached flag pole in front of the building. The City affixed to the cairn a brass plaque which says "Presented to the Southern Alberta's Old Timers by the City of Calgary in the Province's Golden Anniversary Year 1955." Today, Canadian and Albertan flags fly above the cairn. Since the dedication, additions to the building have been constructed, the first being the additions of kitchens on the main floor and in the basement, the second being a new front entrance and an office on the main floor. To celebrate Canada's 100th birthday, SAPD erected the Centennial Gate at the site. SAPD attached to the Gate, brass plaques bearing the names of pioneers of Southern Alberta. In 1988, further names were added to the gate bringing the total number to approximately 2000. Over the years our members have voluntarily spent enormous amounts of time and money maintaining the building and grounds and researching and preserving the history of the pioneers. To make this special historic resource known and appreciated, SAPD constructed a new entrance sign at street level in front of the Centennial Gate, in 1998. The Memorial Building was designated as a City of Calgary Municipal Historic Resource.